Jólan van der Wiel unveiled an incredible set of stools shaped using magnetic fields and the force of gravity at the Dutch ‘Transnatural‘ exhibition during the Milan furniture Fair. The stools were made by placing a mix of iron and plastic in-between strong magnets that pull the material into unique and organic shapes. With their energy-efficient production method and wonderfully peculiar shape, these ‘Gravity Stools’ should be at the top of any Salone stalker’s must-see list. An innovative project created by playing with the forces of gravity and magnetic energy, these unconventional seats focus in on production techniques, instead of the final product. Take a minute to watch the video above, and we’re sure you will find yourself falling for this design. Jólan van der Wiel unveiled an incredible set of stools shaped using magnetic fields and the force of gravity at the Dutch 'Transnatural' exhibition during the Milan furniture Fair. 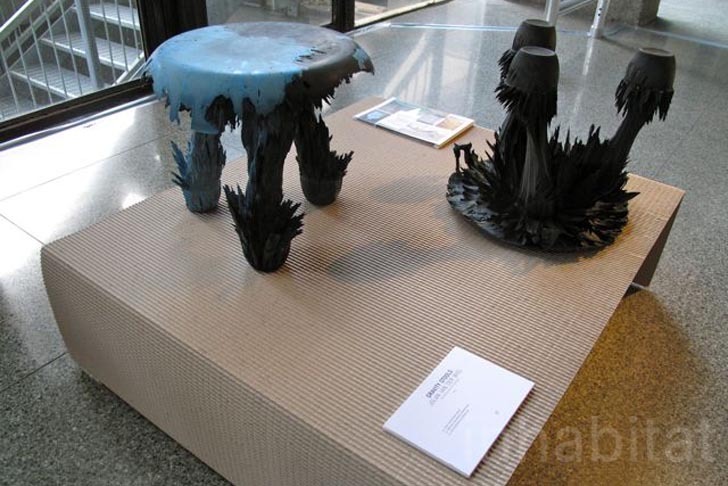 The stools were made by placing a mix of iron and plastic in-between strong magnets that pull the material into unique and organic shapes. With their energy-efficient production method and wonderfully peculiar shape, these 'Gravity Stools' should be at the top of any Salone stalker's must-see list.